If it wasn’t immediately clear, Austin City Limits, the celebrated public-television show also responsible for the now-20-year-old ACL Festival, tapes its episodes pretty far in advance. Last year’s Coldplay New Years’ Eve special, for example, was taped that summer during the fest, while the band was in town to play. 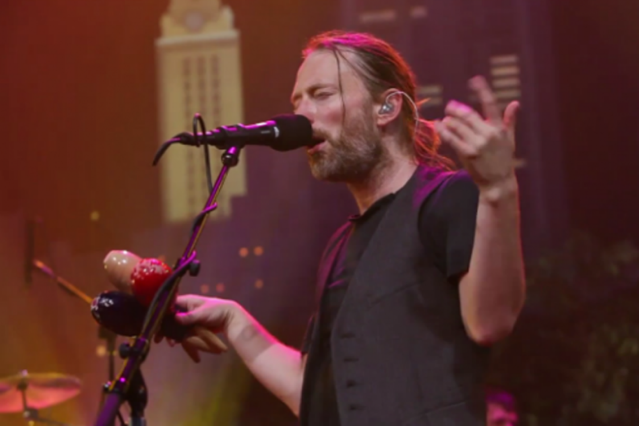 You’re going to have to wait for the fall to see the full episode Radiohead shot this past March, but ACL has kindly shared a sneak preview, a full clip of the band playing “Lotus Flower” (via Pitchfork). Aside from the obvious (that the performance foretells the awesomeness of the episode to come), there’s one ongoing question: the Yorkey-tail. Yea or nay? (Let us know in the comments below.) In other Radiohead news, Gawker alerted us to the fact that Carrie Manolakos, the former Broadway actress known for her role as Sophie in Mamma Mia!, recently covered “Creep” with devastatingly awesome results.